We created Lip Niche to be more than just another lip gloss. There is a message behind each one of them. All of our lip colors represent a cause that we are touched and inspired by. Our vision is to lead by example and give back to the world. 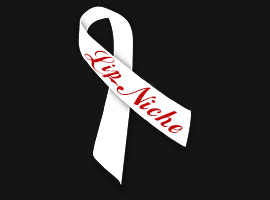 When you buy Lip Niche, you are buying with a purpose! Not only will your lips look and feel great, You will be making a difference. Your lips will thank you! WHATEVER WE WANT! Causes are very important to us, and since we don’t have ribbons for all of them, we decided to create a ribbon that would be dedicated to issues that we feel moved and inspired by. CLEFT LIP: Which can also occur together as cleft lip and palate, are variations of a type of clefting congenital deformity caused by abnormal facial development during gestation. A cleft is a fissure or opening—a gap. It is the non-fusion of the body's natural structures that form before birth. Cleft lip or palate is one of the most common birth defects, affecting one in 500 children in the US. Unless treated cleft palate can interfere with feeding, speech development and hearing. DOMESTIC VIOLENCE, BULLYING, ANIMAL ABUSE, SUICIDE PREVENTION: The color purple represents the courage, survival, honor and dedication to ending domestic violence. There is an overwhelming amount of animal abuse reported every day. Bullying is defined as use of force, threat, or coercion to abuse, intimidate, or aggressively dominate others. BREAST CANCER: The pink ribbon is an international symbol of breast cancer awareness. Pink ribbons, and the color pink in general, identify the wearer or promoter with the breast cancer brand and express moral support for women with breast cancer. Pink ribbons are most commonly seen during National Breast Cancer Awareness Month. HUNGER, SKIN CANCER, AND RACIAL TOLERANCE: The orange ribbon signifies many causes. Among them are hunger, racial tolerance and skin cancer. Hunger is an issue that affects people from middle class through poverty. Over 50 million Americans struggle to put food on the table and there is a lack of food security in every county in America. HIV, HEART DISEASE: The red ribbon symbolizes compassion for people living with HIV/AIDS and heart disease. Current developments in modern medicine have increased the lifespan of those with the virus by 10 years. Cardiovascular diseases are the leading cause of death globally, but can be prevented by improving risk factors through healthy eating, exercise, avoidance of tobacco smoke and limiting alcohol intake. 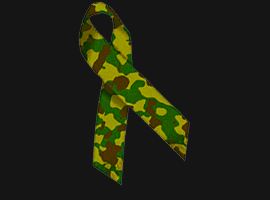 MILITARY/MILITARY FAMILIES: The camouflage ribbon acknowledges and supports the entire military community and all of its service members and families. It honors those who have been deployed, returned to home, any service members of the past or present, or those who have died or have been wounded. LUNG DISEASE: The average adult takes 15 to 20 breaths per minute or more than 20,000 breaths per day. There are more than 370,00 people per year are affected by lung cancer. The following factors raise the risk of developing cancer: Tobacco smoke and regular exposure to second hand smoke; Asbestos exposure; and Radon gas. The best way to prevent lung cancer is to avoid tobacco smoke.